Wood, with central boss. Red reed bands crisscrossed over boss. Painted black, white, rose, blue. Obverse: lizard (?) 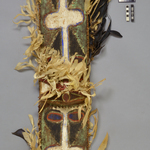 with "eyes" on each side of boss, and small heart-shaped motif at each end. Reverse: 2 serrated discs, each with four large oval notches. Feather-edged.